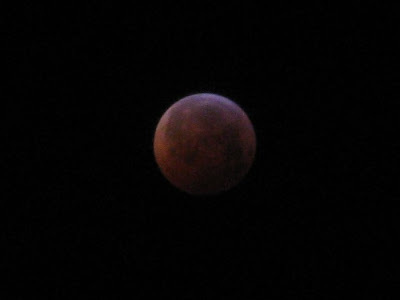 Here's a photo I just took of tonight's lunar eclipse. The eclipse is still occurring as I write this. Very Cool. I was too tired to stay up to watch it & I have seen a few before. Its nice that this one got so much media publicity before the event. Yeah. Often the news doesn't tell you about it until after the fact. What about the Silent Generation?